Think globally, act locally. It’s a cliché but not a bad one. Many companies have become internationally successful by following this simple rule. However, one could also think globally and act globally. When it comes to global businesses there are two possible strategies: 1) to keep the messages and communication global, or 2) to localize them. There are good reasons to choose either of them. It’s impossible to act completely local in these days when everyone and everything is connected to the web. Almost all information is only a few clicks away and people share knowledge actively. Every customer or fan wants to feel equally important. The word will spread like a virus if someone notices an unfair localization effort from a brand. A coherent brand image is a good reason to keep the message global. One, single message everywhere minimizes the risk of image crises. An honest and transparent approach won’t confuse the modern people who travel and see communication and marketing material in many places. It’s very likely that the customers of an international brand have some things in common no matter where they are located. Thus, sometimes there’s nothing to localize. If the global message works everywhere the company can concentrate on other things than creating forced local messages. The localized version should feel like it is the original version. It takes a good amount of resources (time, knowledge and money) to build the feel of real authenticity. Sometimes it’s not worth it. If the localized outcome doesn’t quite meet the goal the results might even be negative. No company wants to feel like false or untrustworthy. The ultimate challenge is to keep up with the ever-changing environment in every market. It isn’t enough to localize once. The pace of online communication is fast, and with multiple languages and messages it’s even faster. The globe might be getting smaller due to the internet and fast travelling possibilities, but the world isn’t even close of becoming 100% homogenous. Even though globalization seems to unify cultures, local factors create the local environment. Cultures have such a long history that their position will be strong also in the future. Humans form cultures as well as cultures form humans. People live and grow inside human networks. These networks teach us how to behave, speak and interact with others. It’s said that one half of a person is based on genes and the other half comes from the environment. No matter how cosmopolitan a person is, no one can escape the influence of the growing environment. Because no one can interact with everyone on this planet, locality won’t mutate into globality. There will always be smaller entities or groups who share the same values and everyday experiences. When the message is well targeted it will resonate positively among the group. Global messages will always remain somewhat distant. By localizing, companies can avoid cultural mistakes in their communication. It’s dangerous to oversimplify and to group people into too big units. It’ll only feel arrogant. Local employees are able to see these pitfalls and help with producing high-quality and relevant localization. Some major trends happen ‘everywhere’ but often they aren’t happening at the same time. Localization eases both message targeting and timing. While localization tides resources, global communication isn’t free either. It takes knowledge, experience and some luck to find a one-size-fits-all message. The risk of a major failure is real when everything lies on one chance. Often risk avoidance leads to a solution which is both lame and boring. In the worst case, the response is non-existent and no one cares. Therefore localization is part of risk management. Companies are able to test and innovate many new things and concepts in different markets. Best solutions can be utilized in larger areas and not-so-successful ideas can be forgotten. Which one do you think is the better strategy? If you decide to localize you can ease you work by using a localization tool. It does all the technical steps for you and automates repetitive tasks. 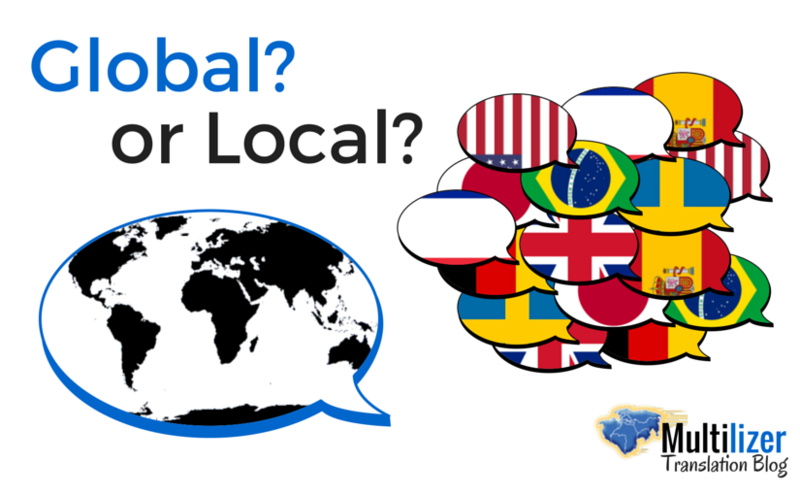 Learn more about localization tools. Next Next post: Are you building up or breaking down barriers to purchase?